Many people are familiar with white radish. But it also comes in black, red, purple, rose and lavender. The round, pink variety is a traditional winter vegetable in the Garhwal region, where it is known as mula, meaning root. Before the popular white radish was the small round mula. There are references that radish was introduced in China around 500 BC. The Chinese developed new varieties with larger and longer roots and a much milder taste than mula. 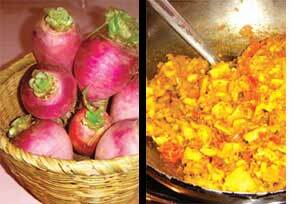 Mula was once a prominent vegetable crop in Uttarakhand. It grows in abundance between the altitudes of 800 metres and 2,500 metres in the Himalayan region. A few hybrid varieties of mula are also available in big stores like Spencer's. Though the pink variety is still eaten, the younger generation is not familiar with its recipes. Sharp in taste--it belongs to the mustard family--radish is nutritious. Ninety per cent of it is made up of water. It is as rich as bananas in potassium and has about half as much ascorbic acid as oranges. Radish is also an excellent source of magnesium and vitamins A, B, C, D and E.
The people of Garhwal consider the pink variety a panacea. Its medicinal value is documented in The Wealth of India, a book on plant and other resources brought out by the Council of Scientific and Industrial Research. It is good for diabetics, lowers cholesterol and enhances the metabolism rate. It is said to be antiseptic, antiarthritic and antirheumatic, and combats scurvy and rickets. It is also used in the treatment of asthma, bronchitis and liver and gall bladder diseases. Radish can be eaten raw to prevent sore throat. Its juice and soup help in digestion. A soup made with its leaves can expel body heat. Ground and toasted white radish seeds mixed with honey are a good appetizer and can soothe the respiratory tract, according to The Wealth of India. You can treat yourself to a feast of only radish--soup, parathey, saag, raita, salad, chutney, pickle, kufli and thechwani. Cooked radish is often added to soups and stews. If you have made up your mind to stock up on radish, here is a helpful tip: store it unwashed in the refrigerator in a perforated plastic bag--this way it stays fresh for about a week.